One of my favorite past times is running! I’ve been a runner for about ten years and it changed my life. I lost over 50 lbs, feel great, and have found more success in life! Now, I offer Individual Run Coaching and Running Camps for others looking to find similar success in running and in life through Empowered 2 Run. As an RRCA and NESTA certified Running Coach, I help individuals reach their personal performance and fitness goals including running 5K races up to marathons. I am a 3:18 marathoner and have completed 26 marathons including Boston as well as numerous 5K races and half-marathons and recently completed the Oil Creek 100 Mile Ultra Trail Race. I am also a Run Coach for Team In Training (TNT) and the Leukemia and Lymphoma Society and fundraise and support for the fight against cancer. Want to run a marathon, half-marathon or 5K race? Is it your first time running or do you want to get faster or go farther? Do you just need some help reaching the finish line because you can’t stay on a training plan or stay motivated? I can help you achieve your personal best! Running is one of the best aerobic exercises for overall physical fitness. Running helps you stay healthy and reduce your chances for major illness. In addition to the health benefits, running can clear your mind, grow your spirit, allow you to find your own inspiration and at the same time inspire others! Lose weight, get fit, look good and feel good! You don’t have to be an elite athlete. It’s not about being fast or winning races. It’s about setting your mind to something and making it happen! “Ernie gave me the confidence that I can become a stronger runner and he became my inspiration as I started believing 26.2 miles really isn’t that far. I was able to complete my first marathon in less than my goal time and I’m already thinking about the next one.” – Polly M.
“I never thought I would be this good of a runner! Your coaching has been the best thing for my self-esteem and for my fitness level. Thank you so much for your coaching support, and encouragement.” – Tammy H.
“On my own, I struggled for several years trying different marathon training programs – often with poor results and no Boston qualifying times. With Ernie’s coaching and training schedule, I was able to focus on each workout with a specific training purpose instead of blindly logging mile after mile. 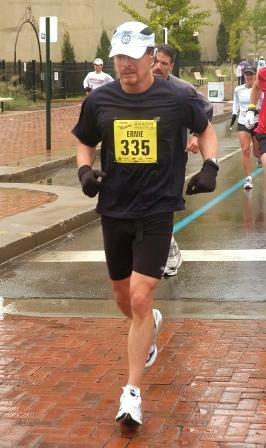 In addition to knowing marathon training inside out, Ernie is a great motivator and personal running coach. He has definitely helped me achieve my running goals. Now I’m going to run the Boston marathon in 2009!” – John L.